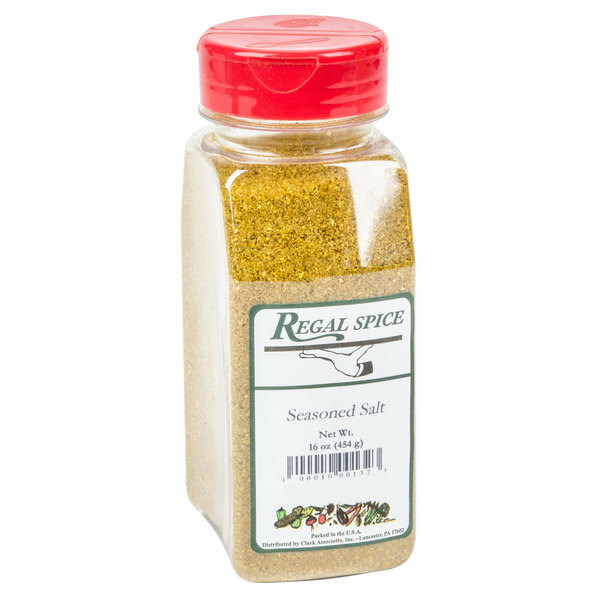 Regal seasoned salt will add a variety of flavors to your meats, soups, salads, and other foods. 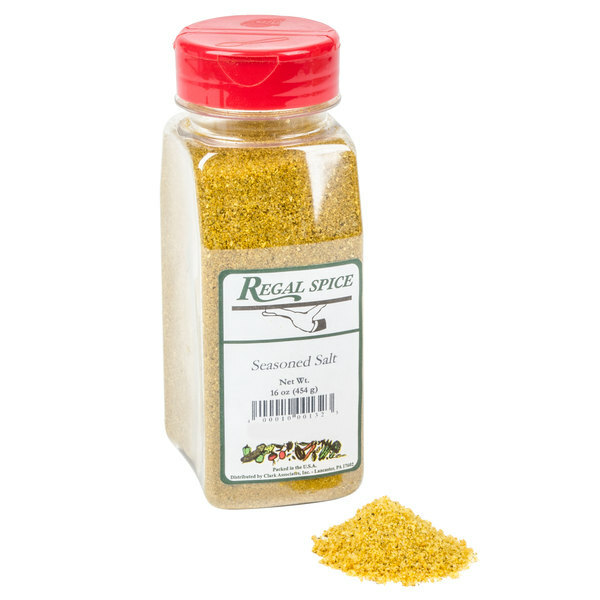 Enhance the tastes of your appetizers, entrees, and sides by using this Regal seasoned salt. Thanks to its versatility, it can be added to a variety of foods, including meats, soups, salad dressings, french fries, and vegetables. Also, since this salt is packaged in a 16 oz. recloseable container, the contents will stay fresh while they’re being stored. Additionally, the cap enables cooks to either sprinkle or measure out the right amount of seasoned salt being called for in their particular recipes. "The regal seasoned salt is a great product. Perfect blend of spices that makes seasoning veggies very easy. The blend is fantastic and I will continue to use in my cooking." This seasoned salt has the just the right amount of each item on its ingredient list, giving it the perfect taste. By having a consistent blend ready to use straight out of the container, your staff won’t have to waste time measuring out individual spices. 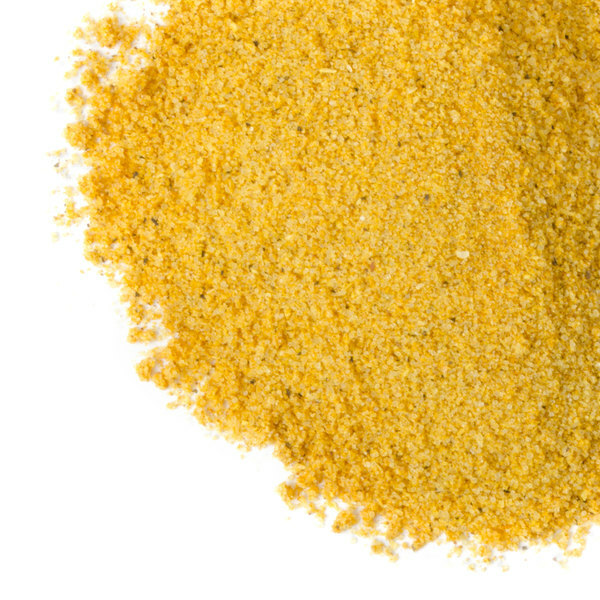 This ingredient features a savory combination of salt, sugar, paprika, cornstarch, and other spices, giving it a zesty flavor that is sure to complement your dishes. 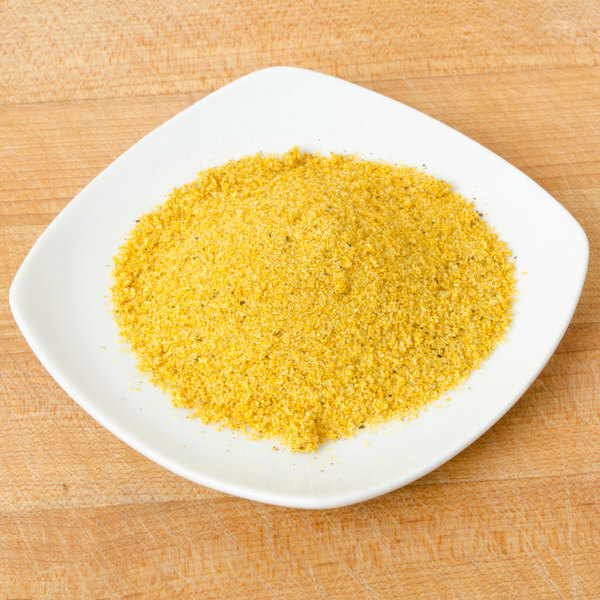 Seasoned salt is commonly used to spice up the flavor of sauteed vegetables, meats, and other foods. Many cooks also add it to meat rubs, sauces, and marinades. 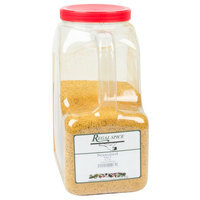 Item #: 10207363 Regal Seasoned Salt - 16 oz. Item #: 10200364 Regal Seasoned Salt - 8 lb. 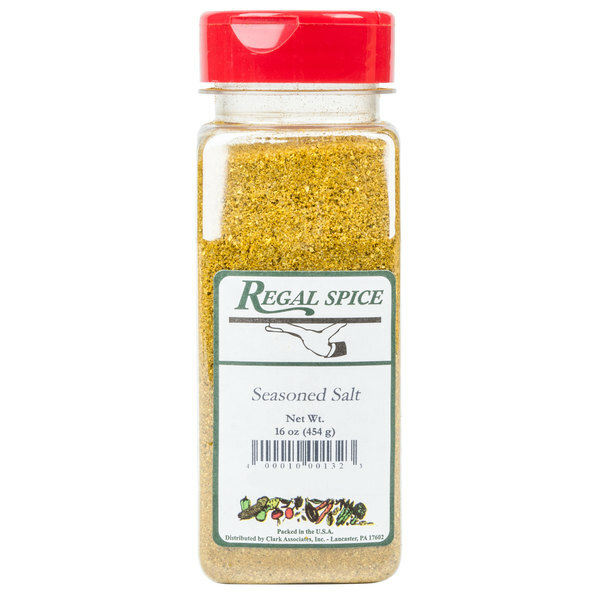 Overall User Rating: Regal Seasoned Salt - 16 oz. I always have this seasoning on hand. When you don't know what seasoning you should use, just use these. They will get the job done ! Love this blend. Tastes good on everything we have tried it on so far. Especially good on eggs and hash browns. Super value, and excellent choice of package size for easy dispensing and storage need prep area. We ordered the small version of this seasoned salt to see the flavors that came out. After testing it our cooks really enjoyed the product and we went ahead and bought the bigger version of it. Great product. This seasoned salt is fairly standard flavor, but seems to carry a little more punch to it. I like it. I think it's a little stronger because it is better quality than what I have been used to buying. The biggest plus for this product is the price is really low, especially for the quality. This might be the best seasoned salt blend that i have ever tasted. So much depth of flavor is provided by this seasoning blend. Highly recommended. We tried the small one pound container the time. We liked it so much we started buying the 8 pound. We use several per month and will continue buying this product. It is not that I like it better than its more famous competitor, but I like it different, if that makes sense. I use it on tots and fries, and I really enjoy the change from the other brand. This seasoned salt tastes really umami and reminds me of chicken soup flavor but with a very slight bitterness and sweetness. I use it both for seasoning meats and vegetables and for flavoring broths. This Regal seasoned salt is the most used spice in my kitchen. It gets used on almost every dish and always gives it that extra great flavor! This is a great seasoning salt blend. I have ordered it several times now and it's very consistent. And you can't beat the price either! This is a favorite of mine on steak and pork chops. It really brings out the flavor of the meat and just tastes wonderful. This is a much better value than you get at the big box stores. Excellent quality seasoned salt - as good as Lawry’s, but much cheaper. 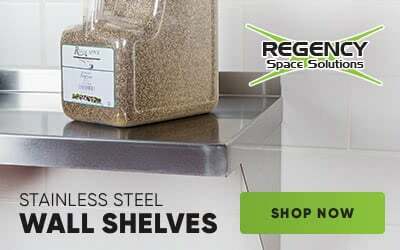 We use it weekly in our catering kitchen and have found that Regal is a great brand! Regal seasoned salt is a very versatile spice that can be used in multiple cooking applications. 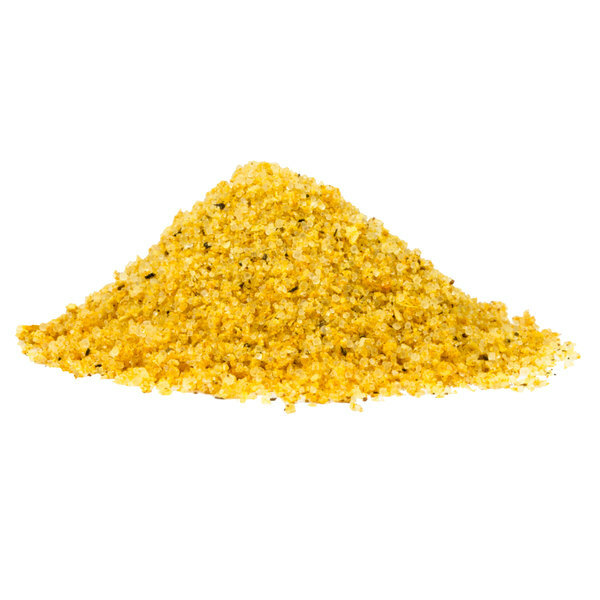 Use it as part of dry rub on chicken or beef or in stock for extra flavor. We are rating it 4 stars because there are definitely better seasoned salts on the market but they will command a much higher price. This 16oz container is a great deal. Good for burgers, french fries and other food items. Its also good on vegetables to make them taste better and appeal to those who may not care for them. This is a great value for a great product. Taste like the name brand without the cost. The spice was nice and fresh. Cost was much lower than other suppliers and shipping was fast.